Tonight we add the last stadia in our project of adding new database positions for every victory of Euro 2016 knock-out stage. We selected two stadiums of clubs you should know, especially that one of them will begin its first Europa League campaign this summer. Yes, Arouca and Tondela may be small towns, but they have ambitions that might come as surprising to some. They also have modern stadiums that we present to you now! The football complex south of Tondela’s heart was built in 2005, when local side CD Tondela managed to grab promotion to the 3rd league. At that point they received the main field with two grandstands (southern main one and eastern curved terrace), a training pitch and an indoor hall. 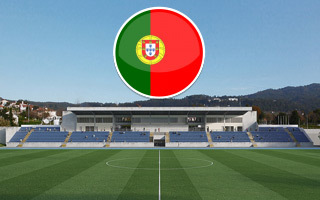 Two following promotions not long after resulted in the team reaching Portugal’s top division in 2015, forcing further works. The building then received its north and east stands, raising capacity to some 4,500 seats and offering floodlights for nighttime games. The signature feature of this stadium is its outer wall clad with yellow and green tiles, offering a pleasant appearance.